With its obvious lack of roads, Venice, Italy can challenge travellers of any age – but especially the less mobile. But whether you get there on foot, water bus or gondola, there is one Venetian attraction that all visitors to Italy should see – the stunning Piazza San Marco (St Mark’s Square), famously known as “the drawing room of Europe”. 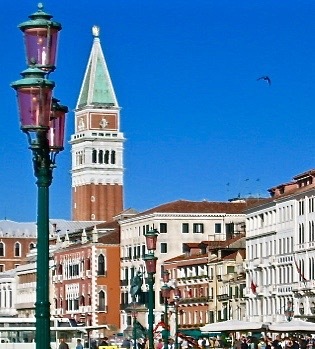 Although one of many wonders in Venice, the Piazza – as the widest piece of flat and open land in the city – has long been both a meeting place for the citizens and an architectural showcase. This is our favourite spot in Venice and is impressive whether approached from the sea or through the heart of the city. Located just off the Grand Canal, the Piazza San Marco was built in the ninth century as a small square dotted with trees. 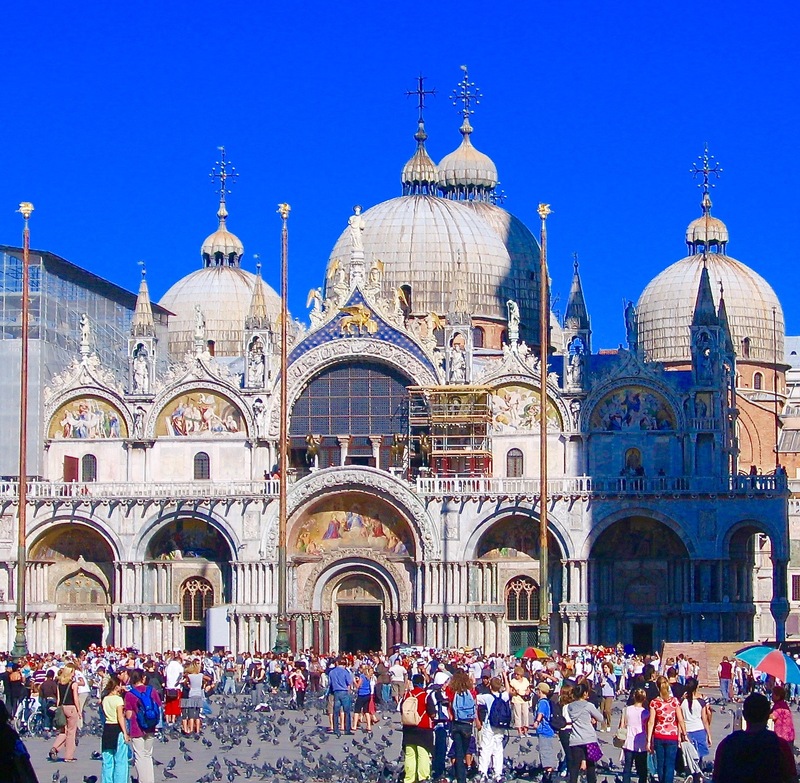 Its centrepiece is St Mark’s Basilica, that sits on the eastern end of the square. 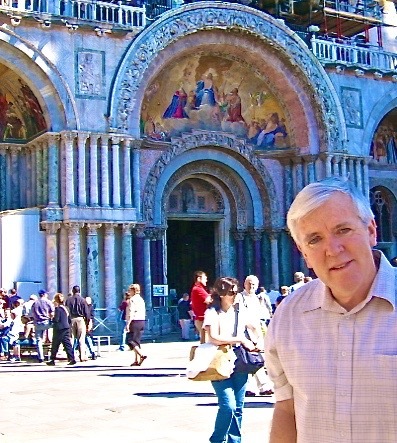 Commissioned in 1071, this amazing church, with its ornate domes, is built in Venetian-Byzantine style. The building is said to contains some of the relics of Saint Mark the Evangelist, which were apparently stolen in 828 by Venetian merchants visiting the original resting place in Alexandria, Egypt. Big crowds of travellers, locals and pilgrims are attracted to the basilica. 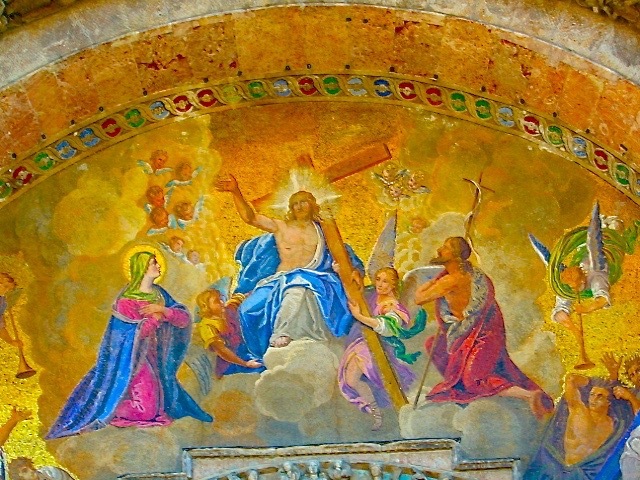 Before you even enter the building, eyes are automatically drawn to the remarkable murals and mosaics that decorate the exterior above the doors. The basilica has a separate Campanile de San Marco (bell tower) that stands 98.6 metres tall. This slender tower is one of the most recognisable landmarks in the piazza and the city as a whole. Alongside the basilica is the Palazzo Ducal (Doges’ Palace), once the headquarters of the rulers of Venice. 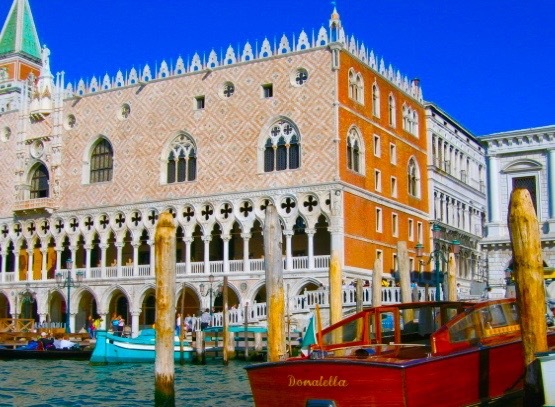 A beautiful Gothic structure, the Palazzo Ducal faces the Venetian lagoon and was completed in the early fifteenth century, though portions of it were rebuilt after a fire in 1574. A paved area that extends from the Piazza San Marco around the Doges’ Palace is known as the Piazzetta, or little square and boasts it own wharf and tall, ornate columns topped by statues. Saint Mark’s Square is bordered on its other three sides by structures known as the Procuratie Veccie and Procurator Nuove, which date to the 12th and 16th centuries. These connected buildings once housed the offices and apartments of public servants from the Venetian Republic, but are now popular arcades and cafes catering to the locals and tourists who can be found enjoying the atmosphere of the famous Piazza at any time of day. We recommend the Gran Caffè Quadri and Caffe’ Lavena. Once again, if walking is not a problem, we suggest you wind your way to and from the Piazza along Venice’s narrow alleys called calle. You’ll discover small squares (campi) where Venetians and their children seem to spend much of the day, – as well as many small shops and cafes that give so much life to this city.